When we first heard of this product, it was from a customer requesting "a candle follower with a little hat on top." Well, we had never heard of such a thing, but over the next few months several similar requests came in. As a result, we set out on a mission to discover exactly what people were trying to find. After looking long and hard, we located an item called a Shade Carrier in the UK. So we immediately began working on a prototype to fill these requests. Here is the result, and we couldn't be happier with the finished product! 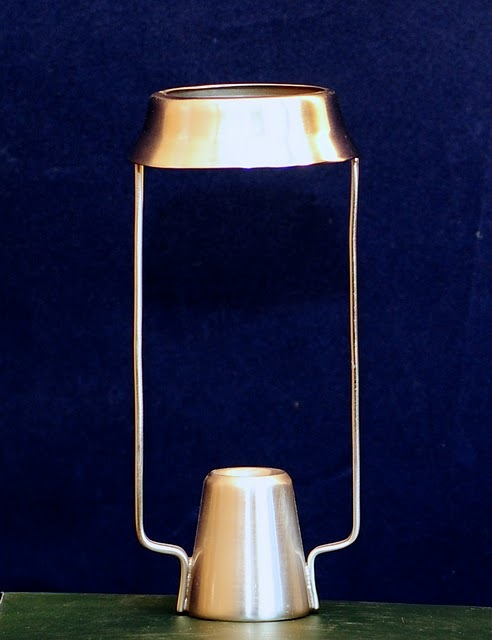 Cast of solid brass with a heavy pewter plating, this carrier is intended for use on straight sided 7/8 inch diameter candles. It weights about 3.4 oz and stands 5-1/4" tall. The top opening is 1-5/8". Also available in our silver and polished brass finishes. The pewter is lacquered to help the product retain it's beautiful luster. NOTE: Candle shades and Shade Carriers are sold separately here, but are also available as a set. Candles and candle holders not included. I use these on on two of several candles on my table when I entertain. They hold a black metal shades. I never fail to get ohs and ahs. Shaded candles add a real flair and added elegance to my table. LOVED THESE. We have been looking for them for ever and were so happy to find them here. We have the brass and pewter ones and they work wonderfully! Thank you. For stability purposes, we strongly recommend that only 100% beeswax candles are used when burning candles with shades and carriers. Candles of lower quality have burn times that are too rapid, which will cause the shades to tilt while burning. If you prefer to use non-beeswax candles, you can correct the tilt periodically by simply straightening the shades when they list to the side.